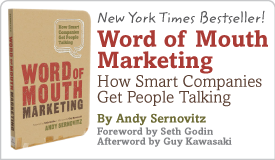 5 lessons from rock bands on how to create word of mouth | Andy Sernovitz | Damn, I Wish I'd Thought of That! This post is from our new project over at WordofMouth.org. Sign up for the newsletter and follow the blog for a whole lot of great word of mouth marketing tips like these.